A tribute to a family brewing tradition since 1867, the Jacob Leinenkugel Brewing Company is introducing a new year-round beer, Leinenkugel’s Classic Amber, available starting this March (see availability note below). A 100 percent malted lager, Leinenkugel’s Classic Amber is a refreshing brew featuring Leinenkugel’s own unique blend of two-row and six-row malts and four varieties of hops. Leinenkugel’s Classic Amber offers a brilliant light copper, golden color and impressive foam retention allowing beer lovers full enjoyment of the complex flavors and aroma. “Leinie’s Classic” features a blend of Pale, Caramel and Munich malts to offer an unmatched flavor complexity, while four different hops – Cluster, Cascade, Mt. Hood and Hallertau – balance the malts perfectly. Recognizing their German heritage, Leinenkugel’s brewed this new brew in Reinheitsgebot tradition where the only ingredients permitted are malts, water, hops and yeast. Brewed in small, high-quality batches at Leinenkugel’s brewery in Chippewa Falls, Wis., Leinenkugel’s Classic Amber offers an understated creaminess and moderate carbonation, making it the perfect beer complement for classic food favorites like fried chicken, steaks and sirloin burgers. Thanks to its complexity, Leinie’s Classic also pairs well with hearty fish steaks such as tuna, swordfish, and salmon. And, it pairs exceptionally well with a wide variety of cheeses including aged and smoked cheddars, offering complementary and contrasting yet balanced flavor relationships. Leinenkugel’s Classic Amber contains 4.9 percent alcohol by volume (ABV) and is available where Leinenkugel’s is sold in 6 and 12 pack bottles and on draft. Classic Amber retails for approximately $6.99 to $7.99 a 6-pack. The bitterness is a 21 IBU and the color is a 10.5 SRM. AVAILABILITY NOTE: Leinenkugel's Classic Amber will be available on draft in the Chippewa Falls, Wisconsin area beginning February 2. It will then roll out on draft to the state of Wisconsin only in mid-February before it is unveiled nationally on March 1. 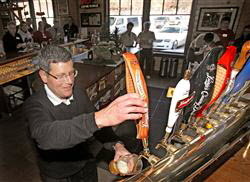 Leinenkugel’s, brewed in Chippewa Falls, Wisconsin, is the leading craft brewer in the upper Midwest. Year-round offerings include Leinenkugel’s Sunset Wheat, Honey Weiss, Berry Weiss, Leinie’s Red, Creamy Dark, Original, Light, and now Leinenkugel’s Classic Amber Lager. In addition to the new 1888 Bock, Leinenkugel’s offers three other limited-release seasonal beers including summer favorite Leinenkugel’s Summer Shandy, Leinenkugel’s Oktoberfest and Fireside Nut Brown. For more information on the rich history of Leinenkugel’s, visit www.leinie.com.